Knoedler & Co., New York. Acquired from the above by the present owner's father. This work will be included in the forthcoming Serge Poliakoff catalogue raisonné, being prepared by Alexis Poliakoff, Paris. "If you let it, your colour will take charge of you. Similarly with your forms: the spontaneous form for an artist to use is always an organic one, but you've got to be in control of it. A child will use all the colours in the box at once, instinctively, and if you don't want to make that same mistake you've got to on studying hard and for a long time. There is no such a thing as a system of pictorical construction, but there are certain universal laws that you can find out for yourself if you study the big masters long enough. It's the law, not the 'system', that counts." 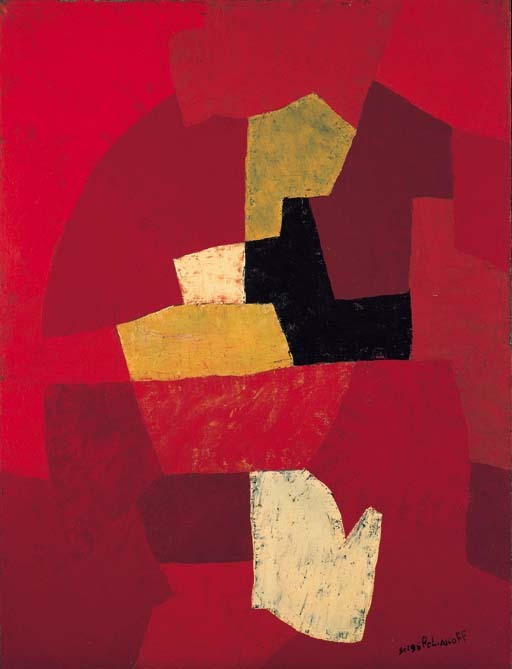 (Serge Poliakoff quoted in, exh. cat., London, Whitechapel Gallery, Serge Poliakoff, Retrospective 1938-1963, April-May 1963, p. 13).